I have barely any taste buds left. My poor scorched tongue is screaming out for water, bread, milk-anything to extinguish this raging mouth fire. The reason for my happy tortured state: the five bottles of molho de piri-piri, Portugal’s famously incendiary hot sauce, lined up beside my laptop. in an attempt to truly understand the appeal of this concoction, I decided to sample each brand. Ignoring the fact that my own Portuguese mother uses a judicious hand when cooking with our hot sauces and pastes, I chose to down the stuff by the teaspoonfuls, naked, without a scrap of food to offset the burn. My conclusion: I must be a super-taster, one of those rare and exalted persons with an exquisitely sensitive palate who finds even mildly spicy foods torrid. That, or I lack the common sense of a second grader. Exactly how hot are piri-piri peppers and their sauce? “While I don’t think they’ve ever tested the piri-piri in Portugal, I’d guess that they’d be about 30,000 to 50,000 units,” adds DeWitt. (Habanero and Scotch bonnet chiles are the hottest at 100,000 to 500,000 units.) Those units are based on the Scoville scale, a system used by the food industry to measure the pungency of peppers. Portuguese cooks, unfazed by the heat, use our liquid fire as a marinade, sauce, and condiment. 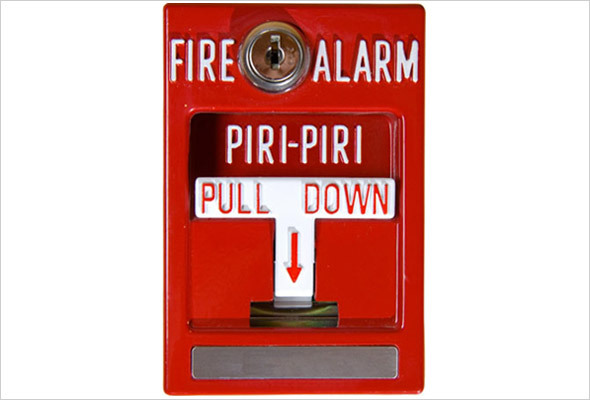 An Internet search for the word piri-piri retrieved thousands of references not only from Portugal but from many of its former colonies — Cape Verde, Brazil, Mozambique, Angola, and Goa — as well as other countries, such as Zimbabwe and South Africa. “There are a lot of classic recipes that use molho de piri-piri,” says Ana Patuleia Ortins, author of Portuguese Homestyle Cooking (Interlink, 2001), “frango grelhado com piri-piri (grilled chicken with piri-piri sauce) being the most famous. And there’s camarões grelhados com piri-piri (grilled shrimp with piri-piri sauce).” Modesty prevents her from saying it, but Ortins has a lip-smacking recipe for grilled pork ribs with piri-piri tucked away in her book. In truth, the sauce can be splashed, drizzled, or brushed on just about anything. A favorite of many immigrants from the Azores — the nine islands some 1,000 miles off the coast of Portugal — is pork sausage doused with piri-piri sauce. Either chouriço or its thinner, sometimes milder, sometimes hotter cousin, linguiça, is grilled in a pan or over coals and then sprinkled with molho de piri-piri. Some families and restaurants even serve small bowls of the sauce on the side for dipping chunks of pão — hearty, jaw-exercising bread. Plus, it’s not unusual for the sauce to be dashed into stews and soups, brushed on fish, or sprinkled on meat before braising or roasting. Now, unless you want to tackle me for my five little bottles of liquid hell, molho de piri-piri (and piri-piri chiles) aren’t generally available in the United States. My lineup was a gift from my friends Ron and Lisa, who vacationed last year in the Algarve, Portugal’s southern resort area. I have stumbled across a few Internet mail-order services that sell the sauce, but while reading the ingredient lists I saw that some of the products contained jalapeño peppers, which provide considerably less heat. The good news is that in the time it takes to order a bottle of the sauce, you can make your own fresh version using some pretty blistering substitutions. To make the perfect sauce, though, you must follow the chilehead’s mantra: Think small and red. “I always use red peppers. I prefer what we here [in the Greater Boston area] call malagueta peppers. And I always buy the smallest I can find,” notes Ortins. As the American palate has become enamored of hotter flavors, it’s not unusual for supermarkets to display the pungency of peppers on charts in the produce section. Try to find the hottest variety available. If you’re stuck, ask the manager for help. If all else fails, don’t freak. A healthy pinch of crushed red-pepper flakes added to your sauce will be more than enough to blissfully blaze and satisfy nearly all of your chili-loving taste buds. Great article, but the best piri-piri sauce is: “Maçarico“, made in Praia de Mira. Every grill house or restaurant in southern Ontario, where I live, has it. You can get it at Walmart also. Al, thanks for adding your favorite to the list. I’ve never tried it, as I can’t find it near me, but I know some people find it too salty. I usually get my peppers—bird’s eye—in a Chinese grocery store. I mix olive oil and a neutral oil together to keep the mixture from congealing in the fridge. I have adapted my own recipe gleaned from many others on the internet. Trial and error refine the sauce to our own palates. That’s the best way to cook, isn’t it, Antonio? That is, by following your own instincts and preferences. Love that. Enter your email address and get all of the The David Blahg updates sent to your inbox the moment they're posted. Be the envy of knowledgeable, savvy cooks everywhere. Sassy!